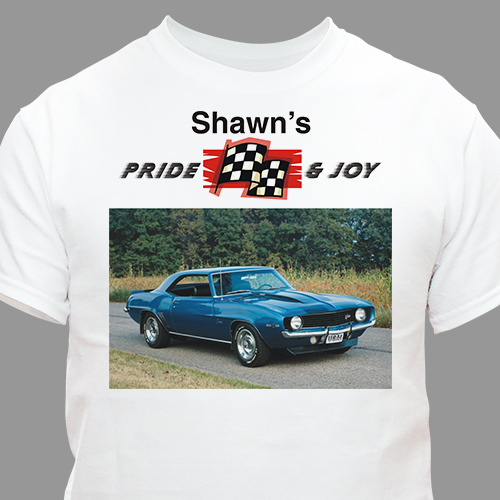 Give the Car Lover in your life a Personalized Photo Gifts T-shirt showing off their favorite muscle car. The perfect Picture Gifts for Dad, Brother, Uncle on Father's Day, special Birthday or just because. Show off your Pride & Joy today with your own Personalized Pride & Joy Photo Tee Shirt. Your Custom Car Photo T-Shirt is available on our premium white 100% cotton Personalized T-Shirt, machine washable in adult sizes S-3XL. Includes FREE Personalization! Upload your favorite digital photo below. Please don't send any photos in the mail, digital photos only. Please enter a photo description. (ex. 69' Camaro) Personalize your Pride and Joy Muscle Car Photo T-Shirt with any name. Recommended pixel resolution (dpi) is at least 800 x 800. Additional Details Our Personalized Photo T-shirt makes an excellent Father's Day Gift! Let Dad show off his favorite car wherever he goes. GiftsForYouNow.com has many additional personalized photo gifts for your special gift giving needs. We specialize in beautifully personalized photo frames, personalized photo mouse pads plus much more.